I used to not care much for vinaigrette style dressings. I’ve always been an “easy on the dressing” or “dressing on the side” kinda gal, mainly because I don’t like my greens swimming in dressing or getting soggy. Admittedly, where I grew up the variety of salads I was exposed to could be described as limited. There was “house” or “garden” salads – consisting of iceberg lettuce, tomatoes, cheese, cucumbers and croutons. If you were lucky there was an alternative option of Cesar salad, or if you wanted to get real fancy you would make your own with toppings of your choosing at the Pizza Hut. Having an Oriental Salad at the Applebee’s 30 miles away was a real exciting change from time to time. So needless to say, I was quite the happy camper once moving to Chicago and discovering the endless possibilities that are salads. Shout out to The Crossing on Southport for being home to one of my all-time favorites: arugula with crispy prosciutto, pears, candied walnuts, and fried honey goat cheese bites. Yum. And guess what it is served with? 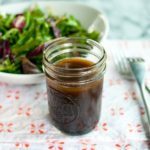 A balsamic vinaigrette. Making your own dressings at home is easy, fast, and affordable. It also allows you to control the quality of ingredients and avoid unnecessary ingredients like soybean oil, sugars, which can be inflammatory, as well as added gums, and preservatives. I like to make and store them in small mason jars that fit neatly in the door of my fridge. Here is how I make this simple dressing at home. Add all ingredients to a bowl or mason jar. Whisk to combine. Store in the fridge for up to two weeks. The oil may harden when cold. Warm slightly in the microwave and shake/stir to remix. An immerison blender can be used instead of a whisk, and will provide a creamier texture. Hi Leoma! Well I’m glad that I could help! I like the simplicity of it and how versatile it is! I’m glad it was helpful for you! What salads have you tried it on?